Traveling by airplane is a very safe way to travel. But with the recent Airplane crash in San Francisco and more people traveling the rest of the summer via airlines I have put together some airplane travel safety tips. These are a few things you can do to make your airplane traveling even safer. Follow these airplane safety tips for the safest flight possible. Typically, most accidents on airliners happen during the takeoff and landing portion of the flight. By purchasing tickets for a nonstop flight, take offs and landings are reduced. Purchasing a nonstop flight will also make for an easier and faster trip to your destination. The bonus of not having to switch planes makes this one of the great airplane safety tips. One of the simplest airplane safety tips is wearing your safety belt at all times. Properly wearing your safety belt will ensure you will travel without injury if the plane were to hit turbulence or get caught in less than perfect weather. (See more on Turbulence in below paragraph) Try to wear your safety belt during the entire flight with the exception of using the restroom. Shortly after boarding the airplane, a passenger safety briefing will follow. This briefing will instruct you with important information for staying safe while aboard the airplane. Pay close attention to evacuation methods, location of exits and how to properly use your oxygen mask. Read along on the safety brochure in the airline pocket in front of your seat. Having this information ready for quick response will ensure your safety if an emergency were to occur. If the airplane is equipped with phones, familiarize yourself with how to use them. Knowing your way around the airplanes environment ranks as a very high airplane safety tip for traveling. If possible, request a seat that is close to the isle. If you find yourself in an emergency situation that requires evacuation, sitting close to the isle will allow you to exit quickly. This may or may not be possible depending on ticket purchases, but it is worth checking into. Being able to evacuate quickly will ensure your safety in an emergency situation. When traveling by airplane, some people choose to relax and have a few drinks. Keeping your alcohol intake to a minimum will keep your senses aware in case emergency situations were to occur. If a situation were to occur when you were inebriated, you might not be able to act in a quick and safe manner. A good airplane safety tip is to limit yourself to one or two drinks during your flight. Keeping the overhead storage bin free of heavy items will reduce the risk of injury if the airplane hits turbulence. If a heavy bag or suitcase stored in the overhead storage bin were to fall out, it could cause serious injury. Keeping light bags in overhead storage will ensure your safety during your flight. This a very simple airplane safety tip that is often overlooked. If you find yourself in an emergency situation, try to remain calm. Panic can increase the risk of injury to yourself and other passengers. Staying calm and listening to the flight attendant and crew members will help you safely evacuate the airplane in an emergency situation. Learning these airplane safety tips for when you travel can help save you time and possibly your life in an emergency situation. By familiarizing yourself with these concepts, both you and your travel partners will be safer and able to face a variety of potentially hazardous incidents. Turbulence: Staying Safe-What is Turbulence? Turbulence is air movement that normally cannot be seen and often occurs unexpectedly. It can be created by many different conditions, including atmospheric pressure, jet streams, air around mountains, cold or warm weather fronts or thunderstorms. Turbulence can even occur when the sky appears to be clear. While turbulence is normal and happens often, it can be dangerous. 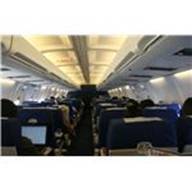 Its bumpy ride can cause passengers who are not wearing their seat belts to be thrown from their seats without warning. But, by following the guidelines suggested on this site, you can help keep yourself and your loved ones safe when traveling by air. When the airplane leaves the gate and as it climbs after take-off. Whenever the seat belt sign is illuminated during flight. In nonfatal accidents, in-flight turbulence is the leading cause of injuries to airline passengers and flight attendants. Each year, approximately 58 people in the United States are injured by turbulence while not wearing their seat belts. From 1980 through 2008, U.S. air carriers had 234 turbulence accidents*, resulting in 298 serious injuries and three fatalities. Of the 298 serious injuries, 184 involved flight attendants and 114 involved passengers. At least two of the three fatalities involved passengers who were not wearing their seat belts while the seat belt sign was illuminated. Generally, two-thirds of turbulence-related accidents occur at or above 30,000 feet. An evacuation slide is an inflatable slide used to evacuate an aircraft quickly. An escape slide is required on all commercial (passenger carrying) aircraft where the door sill height is such that, in the event of an evacuation, passengers would be unable to step down from the door uninjured (Federal Aviation Administration requires slides on all aircraft doors where the floor is 6 feet (1.8 m) or more above the ground). Escape slides are packed and held within the door structure inside the slide bustle, a protruding part of the inside of an aircraft door that varies in size depending on both the size of the aircraft and the size of the door. Many, but not all slides are also designed to double as life rafts in case of a water landing. 1. Have a Plan: Don’t wait until a flight attendant is shrieking at you to “Get out!” to decide what you’re going to do. Aviation safety experts, even the most jaded ones, count the rows to their nearest exits whenever they sit down on a plane. They know that their brain will not work well under extreme duress, and their eyes will not see well in thick smoke, so they need to have a sense of their best escape routes before anything goes wrong. 2. Have Another Plan: Your fellow passengers often have trouble opening the exit hatches — it’s not easy, for one thing, and even flight attendants often run into trouble. Plus, the slides malfunction more than you might expect. In the 2000 safety study, over one-third of the slide evacuations studied involved problems in the functioning of the slides. Smoke can also make your first-choice exit suddenly unusable. So instead of reading the Sky Mall catalog while you’re waiting for the plane to take off, it would be wise to come up with two escape plans. 3. Get Out Fast: If panic does break loose, remember that one of the deadliest mistakes passengers make is to lunge for their overhead luggage. This wastes precious time and clogs the aisle with obstacles. And yet, even if the cabin is full of smoke, passengers will almost invariably reach up to get their briefcases and garment bags. Video footage of emergency evacuations often shows people sailing down the slides clutching rolling suitcases. They also can cost lives. 4. Jump: Another big problem — especially among women and older passengers — happens at the top of the slide. People hesitate or try to sit down before sliding. If everyone would jump instead, as flight attendants will scream at you to do, the evacuation could go 50% faster. Since a fire can burn through the fuselage on an airplane in 90 seconds, faster is much, much better. When everything works right, slides are built to handle 70 passengers per minute. Many now have two lanes. 5. Keep It Together: To avoid burns and unintentional cartwheels on your way down the slide, keep your heels up and your arms crossed over your chest. A lot of injuries happen when people hit the ground and sprain an ankle or break a leg because they came in out of control. Also, women should avoid wearing spiked heels and pantyhose when they fly. Pantyhose can melt onto the skin in the heat of a plane fire (as if you needed another reason not to wear pantyhose). 6. Then Get Out of the Way: Just like on the playground, the area below the slide is not a good place to hang out. If you are the first passenger out, then you should help other people get off. Otherwise, you should get out of the way. Pile-ups at the bottom of the slide can be brutal — and can also make the slide much steeper for everyone else coming down. Congratulations! You’ve survived an emergency airplane evacuation. Now prepare to reflect on your experience — for hours. After an evacuation, even a successful one, passengers often have to spend hours in limbo, waiting for the authorities to release them back into civilization, often due to bureaucratic or legal paranoia. It is infuriating to passengers — and their families, who are often waiting anxiously for them but be prepared for it. 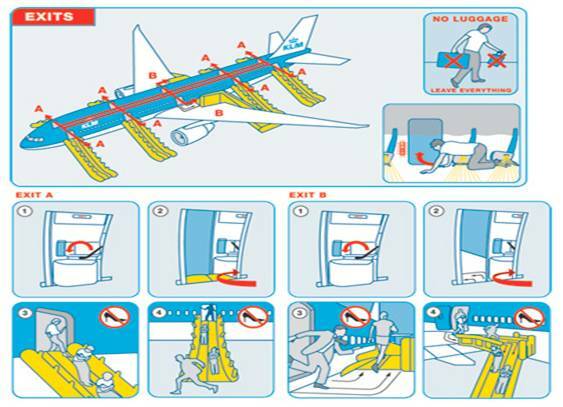 Below is an example of an airline emergency evacuation card. Learn the exits of your aircraft. 1. Keep your shoes on (but not high heels). It makes a big difference when trying to move through the aisles, off the plane, and away. 2. Wear pants when feasible. The slides are not particularly comfortable in shorts, a skirt, or a dress. 3. Count the rows to the nearest exit. Knowing how far to go when you’re crawling along the aisle can make a huge difference in actually getting there. 5. Leave belongings behind, you can replace them you cannot replace yourself and you could endanger others with that delay. Travel Safety First, Travel Safety Always! This entry was posted in General and tagged Airplane, Awareness, Safety, Tips, travel. Bookmark the permalink. Strangely, we’ve had airline safety (and safety training) on our mind lately, too. Here’s a recent blog post that discusses Delta Airline’s humorous pre-flight safety video. I preovide credit and sources back to your webpage? a lot off the information you provide here. Please let mme know if this okay with you.